To add facebook account to mozipost system is simple. we will be explaining the complete steps to adding a Facebook account to your mozipost account in this article. Note: We strongly recommended you to use Google Chrome Browser while adding a Facebook account or and use Firefox for authenticating apps. Please Note: It all depends on what you will like to import,when you select Load my groups it will loads all groups you have joined or created. When you select Load my pages, it will imports all the pages you have liked while the option of Load my own pages will imports all the pages you manage or the ones you are admin of. 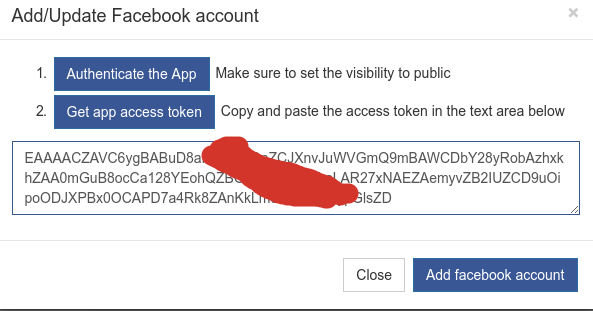 After you done the above section by checking the appropriate box, you can now click Add/Update Facebook Account to begin the authentication process. You will see a new pop-up window that will comes up, just click the Authenticate the App and a Facebook window opens prompting you to login if you haven’t already login. You will now see new window that will comes up asking you to grant iPhoto permission. Click OK , Please always ensure you set the permission to PUBLIC and then click ok to complete the permission stage. Please Note: If you have authenticated iPhoto before will not see the permission again, just move ahead to copy the URL. 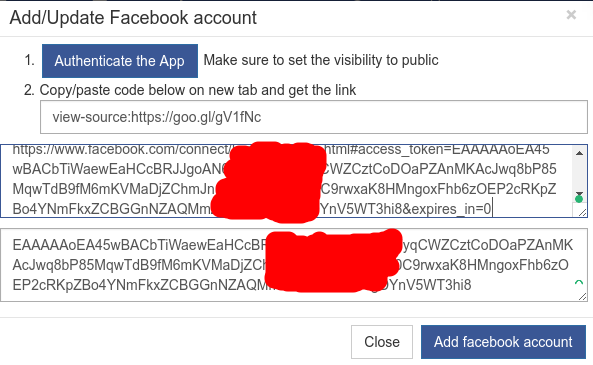 You can now paste the copied URL in the First box and the second will be automatically generated then Click the Add Facebook Account button. And you have successfully added your Facebook account. Please note that when you first login to your Mozipost.com account, you get two notifications. The first states that you have no Facebook account attached to your Mozipost account and the second is that you have not selected any application for sending posts. 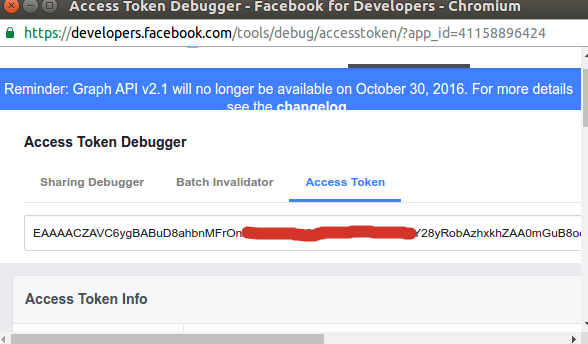 This article will guide you so as to deal with the first error notification, adding a facebook account. Step 4: You will See another pop up comes up requesting you to log into your Facebook account (If you are not logged in). After login into your Facebook account (Or if you are already logged in),you will see a page that will comes up requesting you to grant HTC Sense App permission. NOTE: Remember to set the app visibility to PUBLIC as shown in the screenshot below. Step 5: You can Copy the token in the window that comes up and paste it in the authentication box. Your account is now successfully added, you can proceed to Select your default application for sending posts.